For the past few weeks I’ve been using – and loving – a beta version of our iPhone RSS reader, and according to our mobile guru Kevin Cawley, the new version went live last night. The updated version is even faster than before, and has some really nice additions. My favorite improvement is how it’s smart enough to return to your list of feeds after you mark the last item in a feed or folder as read (I’m a fan of anything that saves a click, especially on a mobile device). And I love how articles I clip on the iPhone reader automatically show up in FeedDemon’s synched clippings. Previous Feed Overload? Hit the Panic Button! Hey, thanks Nick – glad you are enjoying the iPhone and our reader! I’d also like to send my thanks to the folks behind Newsgator mobile. Since I’ve gotten my iPhone (about 2 months ago), it’s been pretty much my primary newsreader (seems the only time I have to catch up on feeds is while I’m away from my computer). Kudos. It’s not just for the iPhone… it works really well on my Treo 755p, and I’ve loved the new attention and URL it got from the early days of Newsgator Online Mobile. I cannot wait until Apple brings the 3G iPhone to the market! Im using Newsgator’s RSS reader and i love it.. Its very much “Apple style” ( in the way it responces) Unfortunately sometimes its loading is very slow here ( Holland) on the gprs network. 3G will definately put an end to this, and make the iPhone to an even better experiance! I looked for a good RSS reader app and couldn’t find anything as good as the mobile version of newsgator. I use it on a daily basis. The only thing i have against it is that it doesn’t open pages in a new window (on the mobile versoin). 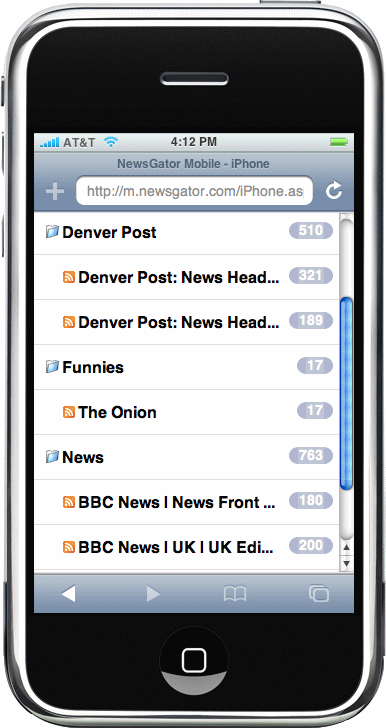 MIORSS reader is a free RSS Aggregator for iPhone. Read all RSS, listen RSS Feed podcast, see video podcast RSS on your iPhone and more. You add your favorite rss/feed. Now have a look at the RSS App. The sync really works fine.